Scrub the sweet potatoes and rub them all over with a little melted butter. Lay two chopsticks on either side of the potatoes, lengthwise, and slice the potatoes down until you hit the chopstick, spacing the slices about 1/4 inch apart. Place a thin slice of butter in between every 3-4 slices of potato. Lay the sweet potatoes in a baking dish and place in the oven, uncovered. Bake for 50-60 minutes until tender. After 15 minutes brush/baste with the melted butter at the bottom of the baking dish every 10 minutes. While the sweet potatoes are baking, combine the candied walnut ingredients in a bowl. Spread it out on a cookie sheet and add it to another rack in the oven. Bake for 3-4 minutes or until the brown sugar mixture has caramelized around the walnuts. Remove from the oven, cool, then break into bits. When the sweet potatoes are done, transfer them to serving plates. Spoon some marshmallow cream over them and torch the marshmallow with a creme brulee torch until golden brown. Alternatively, increase the oven temperature to broil and return the spuds to the oven. Watch very closely so that it doesn't burn. Sprinkle the candied walnuts on top. Serve immediately. Everyone's favorite sweet potato casserole gets an updated look with the same delicious taste! Oh, how I adore Hasselback potatoes! And there's a restaurant in Sweden to thank for having invented them. Compared to a potato that's scrubbed and tossed in the oven to bake, Hasselback potatoes taste ... exactly the same. But that's not the point. They look way cooler! And looks are half the victory in the realm of good eats. And the fact is, as fancy-schmancy as they look; they only take an extra couple of minutes to prepare. Just grab a knife and slice...and slice, slice, slice, slice, slice x 10 ... and there you have it: The beloved Hasselback! But this recipe takes the glory that is the Hasselback potato a notch higher. Hasselback Sweet Potatoes. And not just any sweet potatoes. This is your favorite marshmallow-brown-sugar-walnuts sweet potato casserole – but with a way cooler presentation. Who was it that wrote "a thing of beauty is a joy forever?" John Keats? Yes, well had he sampled these he wouldn't have left the term "thing" generic. They would have substituted in "Hasselback Sweet Potatoes." Yep. These accordion-sliced potatoes make some mighty fine music indeed. Oozing marshmallow torched golden crisp with a hot flame atop the sweet and tender orange flesh of the sweet potato and sprinkled with sweet candied walnuts. 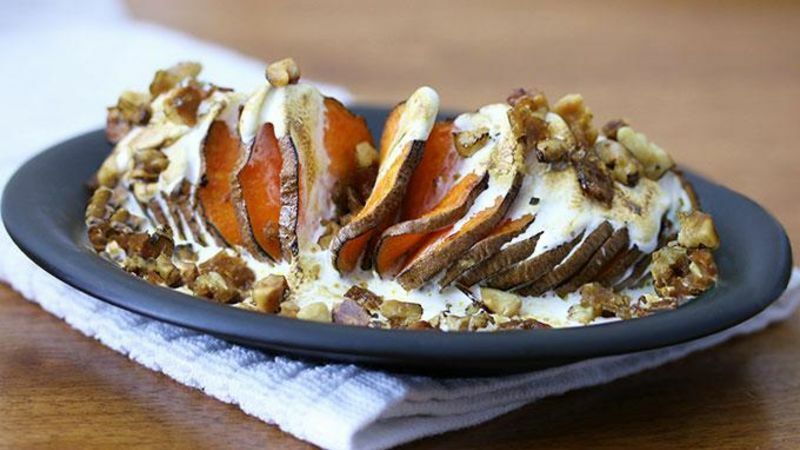 Say it with me: "Hasselback Sweet Potato, your beauty is a joy forever." Give the sweet potatoes a scrub. Then give them a rubdown with a little melted butter. You can go all out and give them a massage, too, if you like. But a butter rubdown is sufficient. And yes, leave the skins on – they're delicious roasted. Next we're going to slice them. You can slice them however thick you want, but the thinner the slices, the more fancy they'll look. You need to slice them as far down as you can while leaving enough potato at the bottom to keep them attached, about 1/4 inch thick. Here's a sweet trick: Lay two chopsticks on each side of the sweet potato and slice down. That way you can freely slice without having to look each time to make sure you're not cutting the potato all the way through. Nifty, huh? Factoid on Sweet Potatoes: "Yams" here in the U.S. are mislabeled and have been since colonial times. Yams are from the tropical regions of Africa and Asia and they not only look completely different but also are an entirely different species of root vegetables that aren't even related. So when you buy a "yam" in the USA, it's really just one of two kinds of sweet potatoes (one has white flesh and the other has orange flesh). Next, admire your work of art. Okay, so they look like some kind of alien creatures from outer space. But don't worry. Once they're drenched in sweet marshmallow fluff the weird factor will be gone! Put a thin slice of butter between every three or four slices. Lay the spuds in a baking dish. Place uncovered in the oven and bake for 50-60 minutes. After 15 minutes, brush/baste them with the melted butter on the bottom of the dish every 10 minutes. While the spuds are baking, combine the candied walnut ingredients in a bowl. Spread them out on a baking sheet and add them to a different rack in the oven. Bake for 3-4 minutes or until the sugar mixture has caramelized around the walnuts. Remove from the oven, allow to cool, and then break it up in bits. Remove the Hasslebacks from the oven and, once again, admire their accordion-shaped beauty. Spoon some marshmallow cream over the potatoes and use a crème brulee torch to torch the cream until golden brown. Alternatively, increase the oven temp to broil and return the spuds to the oven. Watch very closely so that it doesn't burn! Place the spuds on serving plates and sprinkle with the candied walnuts. For more delicious eats, visit Kimberly's food blog, The Daring Gourmet.